As of 17 April 2015, this website has a new look. My first redesign in more than 7 years. I’ve adopted a new set of colours and have finally transferred all my old, static pages onto WordPress. My website and blog are now also tied in together much better. This is what my HTML website looked like from late 2007 to early 2015. 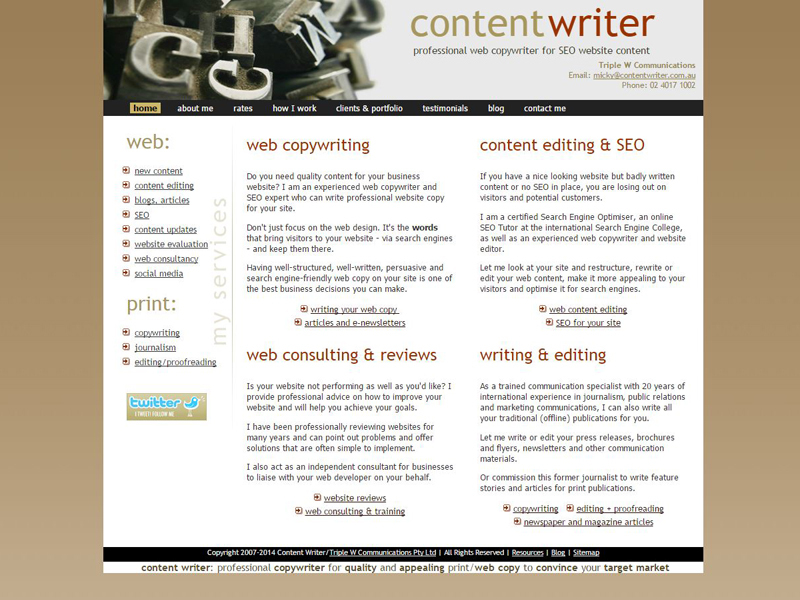 I built my first Content Writer website all by myself, using HTML and Dreamweaver, back in 2007. Only one or two very minor make-overs followed in the next few years, plus the addition of a WordPress blog – a platform I chose in late 2008 when the choice of platform wasn’t as easy as it is now. Are you frustrated with your website and how it performs? You’re not alone. Many website owners (often people running a small business) are disappointed that their website isn’t very successful. Even if your website was created by a professional web designer, there are still countless things that can be wrong with it. But perhaps they’re easily fixed – as long as you know what is actually causing the problems. Posted in Evergreen posts, Content Writing & SEO Tips | Comments Off on What’s wrong with my website? Want to learn more about Search Engine Optimisation (SEO) and Writing for the Web (Content Writing)? Here are some SEO and Web Copywriting courses I recommend. These courses can be taken online, in your own time and at your own pace, making it very convenient. I have taken courses myself in the past with both Search Engine College and Sydney Writers’ Centre, and I can vouch for the reliability of these course providers, while Moz and SEO Book are well-known international leaders in the SEO industry. All organisations are run professionally by experts and you’ll get true value for your money. People often mix up the terms SEO and SEM. They are actually two entirely different things. so I will clarify both terms below. We are basically talking about organic search engine optimisation (SEO) versus paid search engine marketing (SEM/PPC). When you do SEO for your website, you optimise it for the search terms (SEO keywords) you want to rank for in the search engines, so that people will be able to find your site better in the ‘normal’ (organic) search results. If you know how to optimise your website and do it yourself, SEO doesn’t need to cost any money, only time and knowledge are needed. Is your small business easy to find in Google? No, I don’t mean by typing in your exact business name, that’s easy. Does your business come up on the first search results page when you type in the kinds of products or services you offer, perhaps in combination with the town or city you’re located in or your service area? Not only are more people going online (via computer, tablet or smartphone) to search for certain products, services, shops and restaurants, Google is also increasingly moving towards a more locally oriented search engine. You may have noticed getting more and more search results targeted at your local area, often even without entering your location in the search box. Google seems to recognise that many people are actually searching for a business or service in their local area. What do people type into the search box? Writing for websites is different from any other kind of writing. Visitors to websites don’t spend a lot of time reading text on a website. They quickly scan the page with their eyes and will leave in just seconds if they don’t see anything that interests them or that answers the question they had. Web content has to ensure people quickly find what they’re looking for. They have to know immediately that they’ve come to the right page, otherwise you my have lost them forever. Five years ago, before the whole world was talking about content marketing and the importance of quality, well-written, valuable web content, I had an idea. I acted upon it. And became successful. This post explains why I became a dedicated web copywriter 5 years ago, and why I believe I will still be doing this 5 years from now. There was a need for good copywriters with sound knowledge of writing for the web, PR/marketing, website usability and SEO. 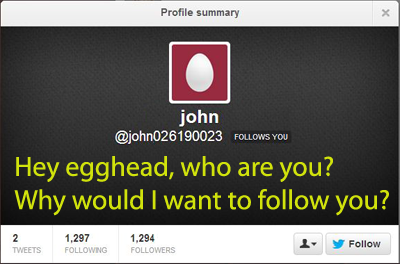 Of all the social media networks, Twitter is my favourite. Whenever I’m at my computer, I have Tweetdeck open with column after column of categorised lists of people I follow and saved keyword searches for easy reference. Not just for myself, but also for a number of clients I tweet for. I also regularly check Twitter on my phone. Personally, I use it mostly to discover interesting content, read breaking news and talk to my peers. That’s what I am getting from it. Because I work alone, Twitter has become my virtual water cooler. A place where I love to hang out. I’m also giving back in the form of sharing interesting blog posts, developments and other little tidbits and anecdotes some of my followers may find interesting, as well as interacting with my favourite tweeps, responding to their tweets and sharing their posts. I’m slightly fascinated by the number of followers I’ve built up over the years, but numbers are just that – numbers – and I would never do anything to try to artificially inflate them. I don’t believe in following everyone back who follows me. That simply makes no sense to me. I only follow people whose tweets I tend to find interesting or useful. 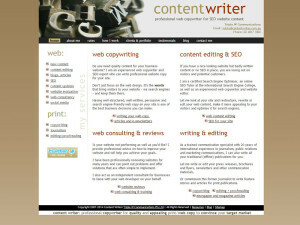 It’s the 8th of the 8th – Content Writer’s business birthday! 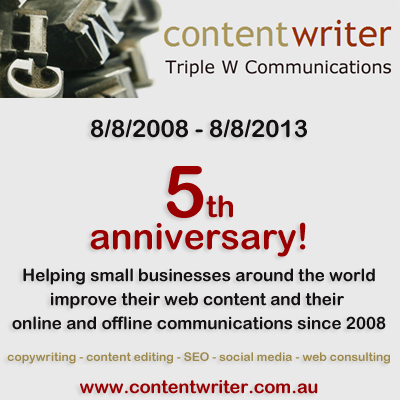 I officially launched by copywriting and web/SEO consulting business on 08/08/08 so today it’s turning 4. Triple W Communications Pty Ltd, which it’s a part of, is much older than that, but I started working for myself full-time on the 8th of August 2008. In last year’s blog post celebrating my 3rd business birthday, I noted I had worked for 54 different clients that past year. That stat has remained almost the same this year (August 2011 – August 2012). A quick count shows I’ve worked for 55 different clients, but it’s worth noting that I have had more repeat work from clients this year than in the year before. Also, I feel I have been able to strike a better work-life balance in my fourth year. I’ve travelled more (yay!) and spent fewer weekends holed up in my office (yay again! ).